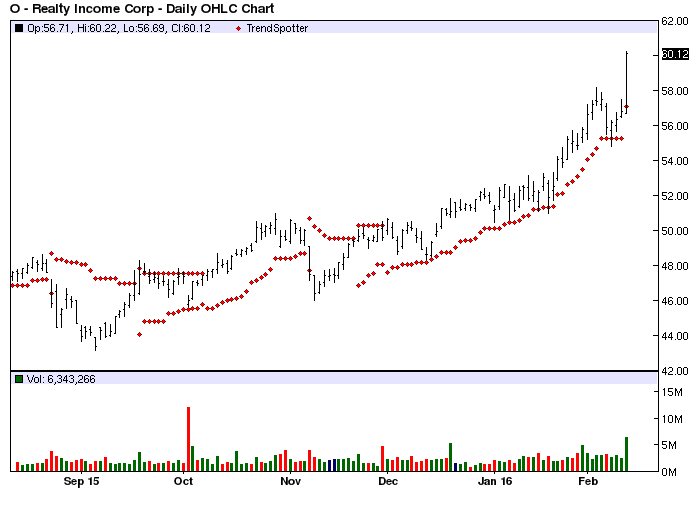 The Chart of the Day belongs to Realty Income Corp (O). I found the retail REIT by using Barchart to sort the All Time High list first for the highest technical buy signals, then I used the Flipchart feature to review the charts. Since the Trend Spotter signaled a buy on 11/20 the stock gained 21.04%. Realty Income Corp is a fully integrated, self-administered and self-managed real estate company with in-house acquisition, leasing, legal, financial underwriting, portfolio management and capital markets expertise. This is not a trading stock and should be held as long as revenue and earnings projections forecast support the dividend.